The US has revoked the suspension and has decided to resume fast processing of H-1B work visas of all categories. This will be subject to a Congress-mandated limit. The decision was a result of the speedy disposal of the applications for the work visas in large numbers. H-1B work visas are in great demand and are extremely popular with IT professionals from India. The H-1B visa allows USA based companies to recruit foreign workers possessing theoretical or technical expertise in specialty occupations. The companies in the technology sector depend on it for hiring several employees every year. The process of issuing Premium H-1B visa was suddenly suspended in April this year. The US Citizenship and Immigration Services has resumed the premium processing now for all H-1B visa applications based on the Fiscal Year cap set at 65,000 for 2018, as per a media report. Premium processing for the annual 20,000 applicants, meant exclusively for hiring professional workers, having a US higher educational degree has also been resumed. Based on the request of a petitioner the premium processing service begins and the USCIS guarantees a 15-day processing time for completing it. USCIS said that in case the 15 - day processing time is not adhered to, the agency refunds the premium processing service fee and continues with the fast processing of the application. This service is only available for the petitions that were pending, and new submissions are not eligible because USCIS has received petitions in April itself to meet the cap for the Fiscal Year 2018. In addition to this USCIS has previously resumed premium processing of H-1B petitions for physicians in the Conrad 30 waiver program, and for interested government agency waivers, and also for a few H-1B petitions which are free from the cap. Premium processing for all other H-1B petitions has been suspended temporarily. 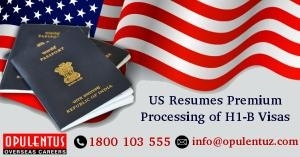 The premium processing for all other H-1B petitions will be resumed depending upon the present workload. If you are looking to Migrate to US, get in touch with Opulentus, a top company for services in the field of immigration, to apply for a visa.Please contact us at [email protected] or call us 1800 103 1555. Our experts will meet your expectations and provide answers to queries.